Learn how to make this typical Portuguese chicken stew with red wine. 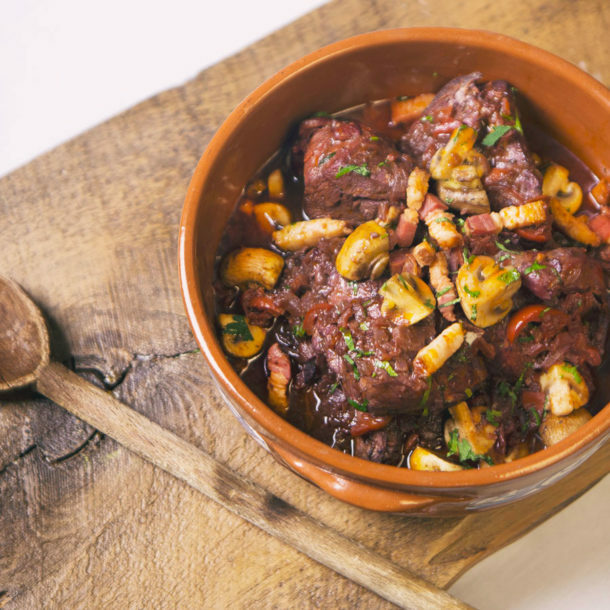 Afordable and easy to prepare, this dish is a healthy option for a convivial meal to enjoy family style on a cold evening. Marinate the chicken in the red wine, the garlic, the paprika, the bay leaves, the salt and pepper. Heat 3 tbsp of olive oil in a large saucepan set over medium heat. Once heated, add the bacon bites and the pieces of chicken. Set the marinade aside. 3. Once the chicken is brown, add the red bell pepper and the mushrooms. 4. Baste the chicken with the marinade and cook over low heat until the chicken is tender (approximately 30-35 minutes). 5. Take the chicken out of the saucepan and reduce the sauce for a few minutes (approximately 7 minutes). 7. Serve with Carlos’ rice.